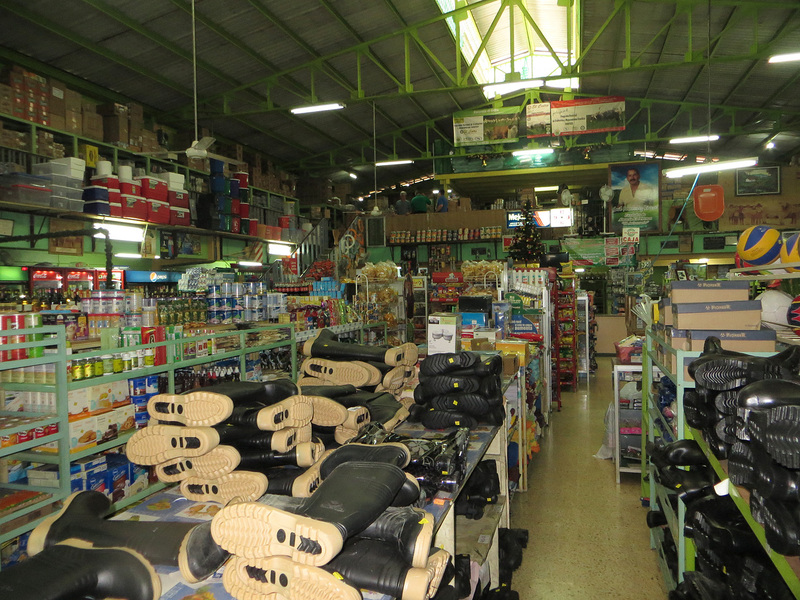 Almost every Thursday, we drive to San Isidro de General to shop. The drive takes about 50 minutes on a windy road through the mountains. 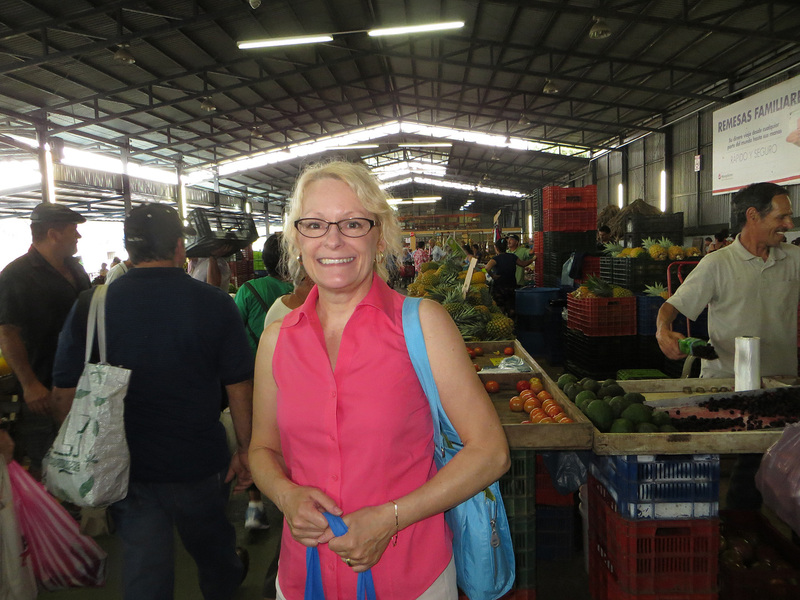 Our first stop is usually the farmer’s market (feria in Spanish) where we stock up on all our fruits and vegetables for the week. We usually buy papaya, mangoes, blackberries, strawberries (when in season), pineapple, bananas, avocados, tomatoes, celery, carrots, potatoes, green beans and lettuce. There are other things there, too, such as meat, baked goods, beans, spices, crafts just to name a few. 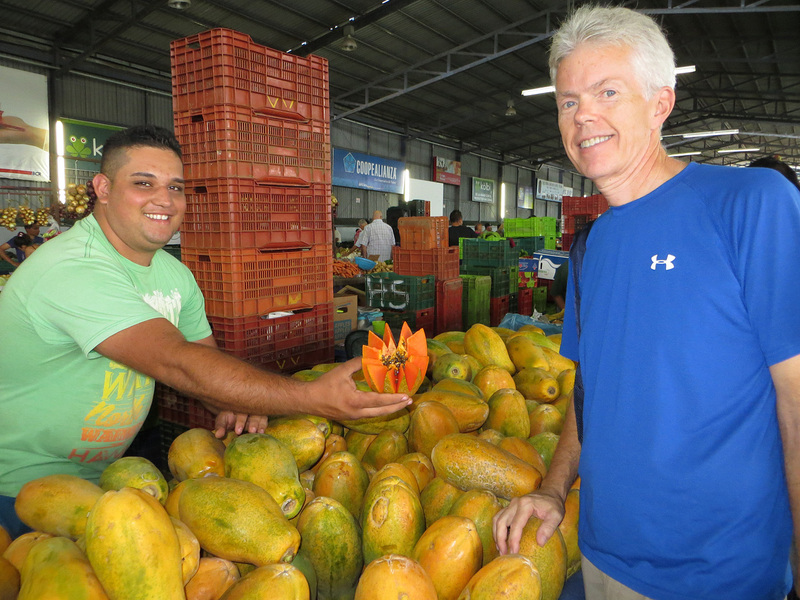 The market is pretty large and there is a good selection from many different vendors. Depending on what we need, our shopping varies. This trip I was looking for a Teflon 11 x 13 cake pan and we also wanted to stop at the butchers to buy some ground sirloin. We left the farmer’s market and drove to the church where there is small parking lot available to the public for a small fee. I think it’s about a dollar an hour. We prefer to park there and then walk to the different shops. 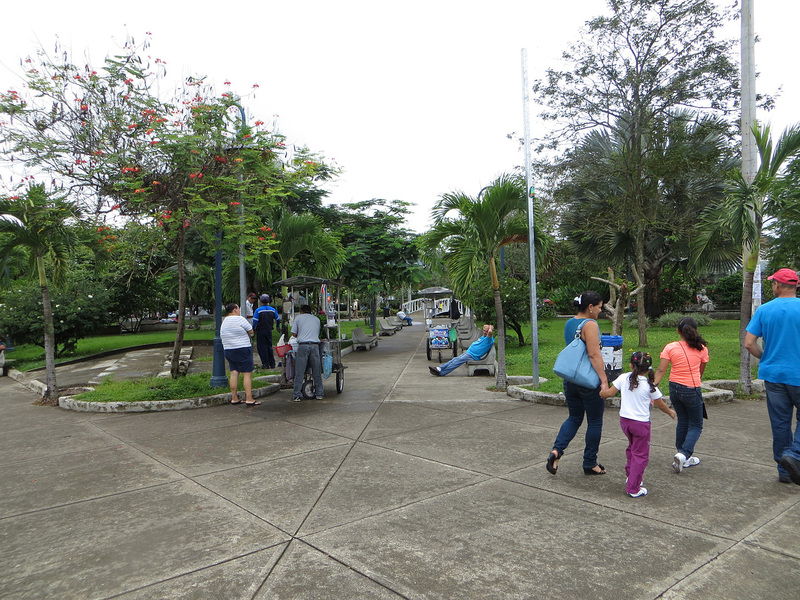 Central San Isidro isn’t a huge place, so it’s easy to walk from one shop to another. This day, the stores we wanted to visit were close to the town park next to the church. 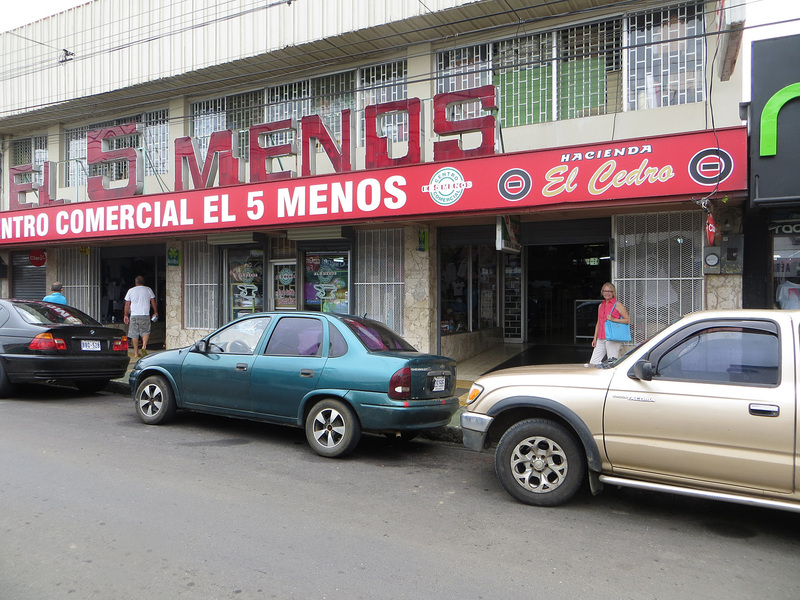 We walked to one of our favorite stores called 5 Menos where they have everything from food, tools, kitchen items to fabric and clothes. Most of the time, things are very reasonably priced there. I did find a cake pan, but it wasn’t very sturdy and it cost more than I wanted to spend – a little over $16. Next, we decided to walk to the plastics store. 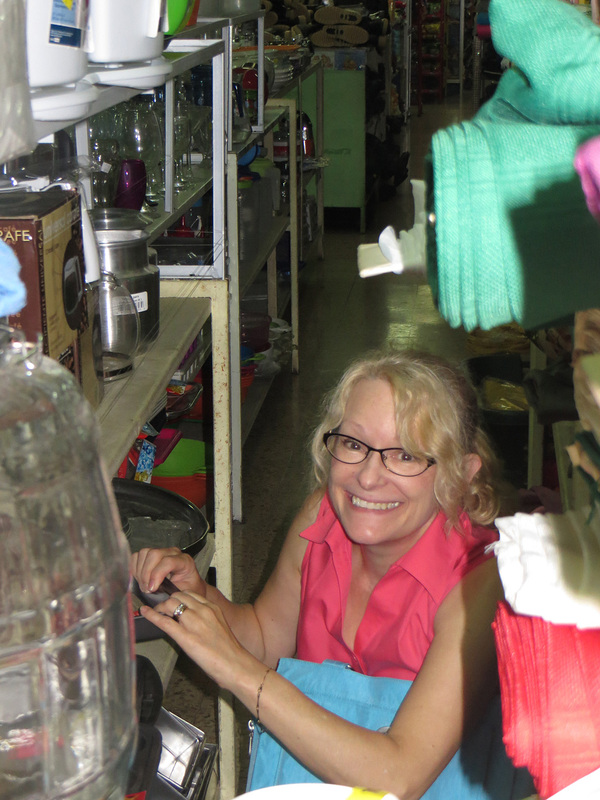 This store has a good selection of plastic bins/baskets in various sizes, buckets & mops, kitchen items and other odds and ends. I found the cake pan there for $10 and it was a nice one. We also bought a Sterilite file bin and a few other plastic containers for food. The sales people tend to hover at this store. They greet you right away and then follow you around the store. When you find something you want, you give it to them and it’s put on the counter, then they come back. 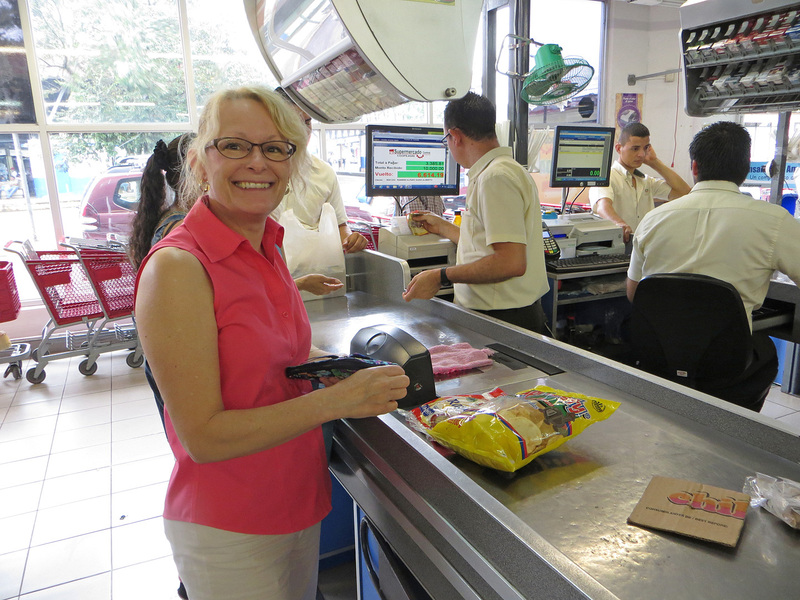 When you’re ready to check out, they total everything up and then you pay at the cashier. After you pay, you show the salesperson the cancelled receipt and you are handed your stuff. So, we didn’t take a photo of that shop. 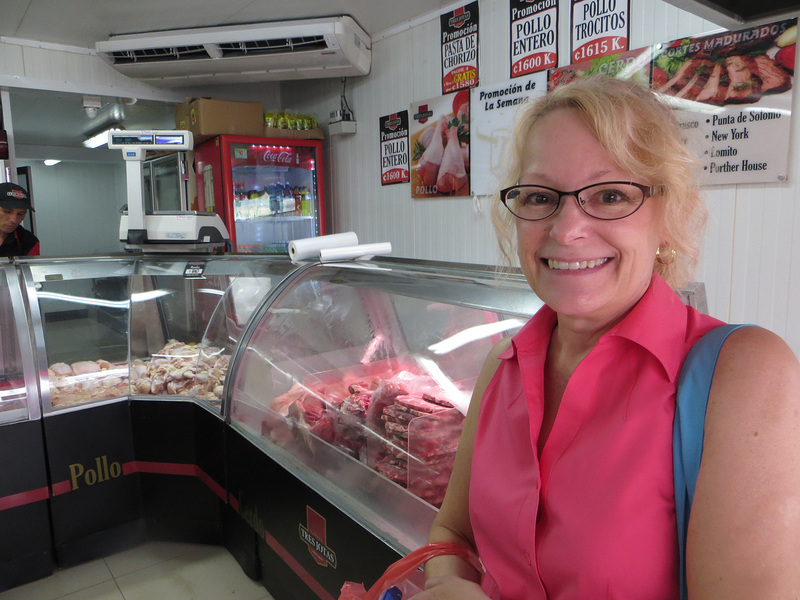 Our last stop before walking back to the car was to the butcher shop. 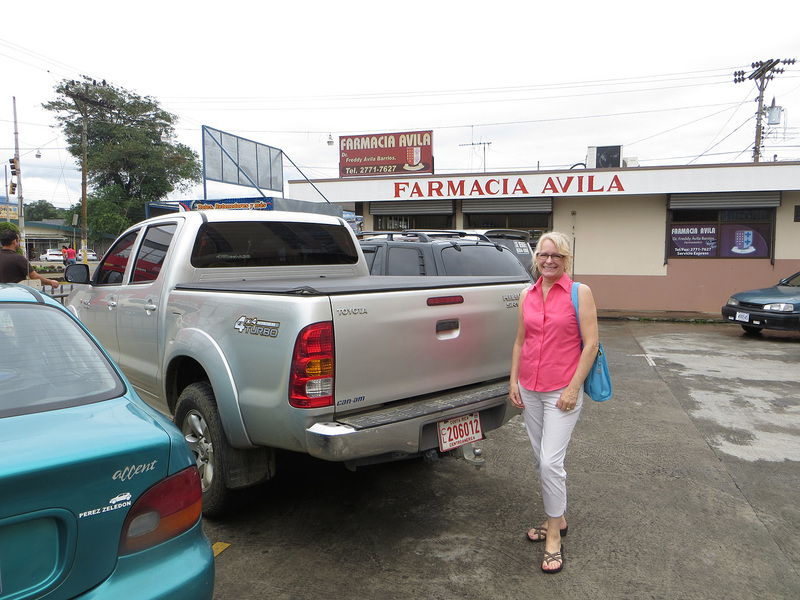 On our way out of San Isidro, we decided to make one last stop at the grocery store next to the bus station. 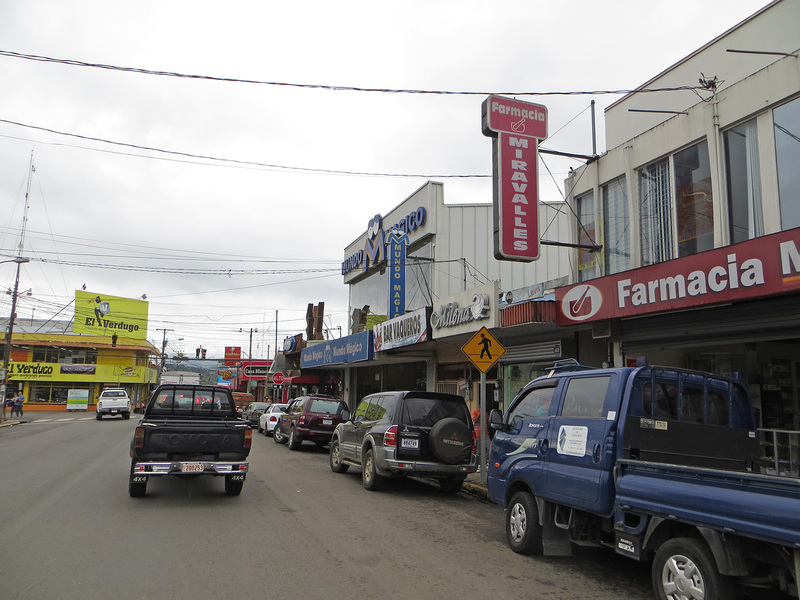 This grocery is probably the largest one in San Isidro and according to our caretaker, Lopez, it has the best prices. 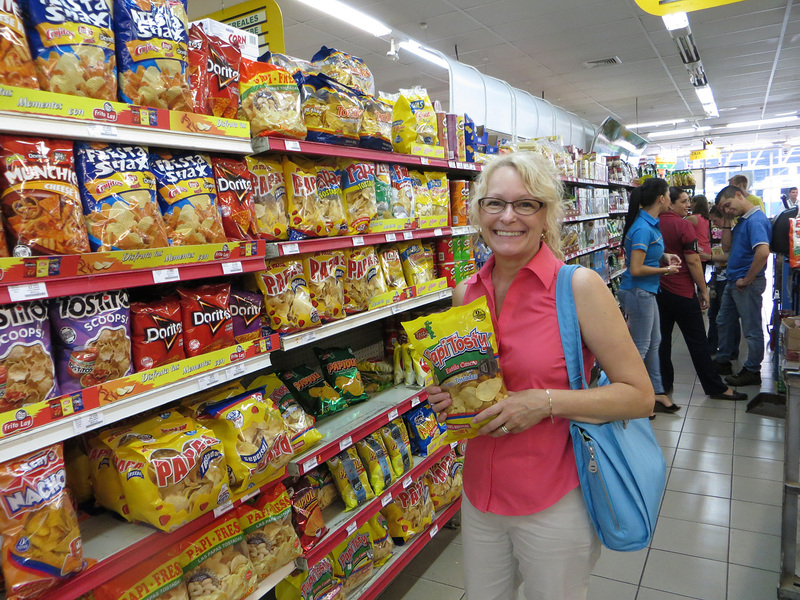 The selection of food is pretty decent overall and we noticed a larger selection of food from the U.S. this trip. 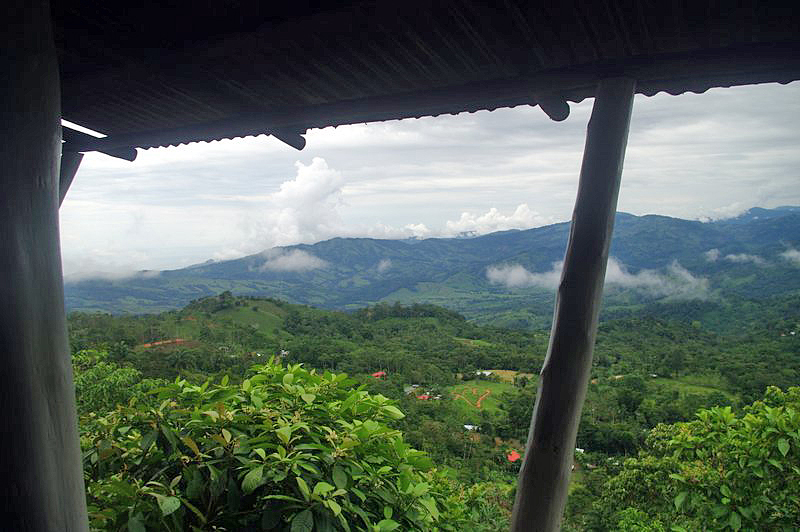 Of course, anything imported from the U.S. costs at least double and sometimes triple the price of what it costs back home because the Costa Rican government institutes a heavy duty on any imported goods. As a result, we try to bring back as much as we can of our favorite non-perishable foods in our suitcases! 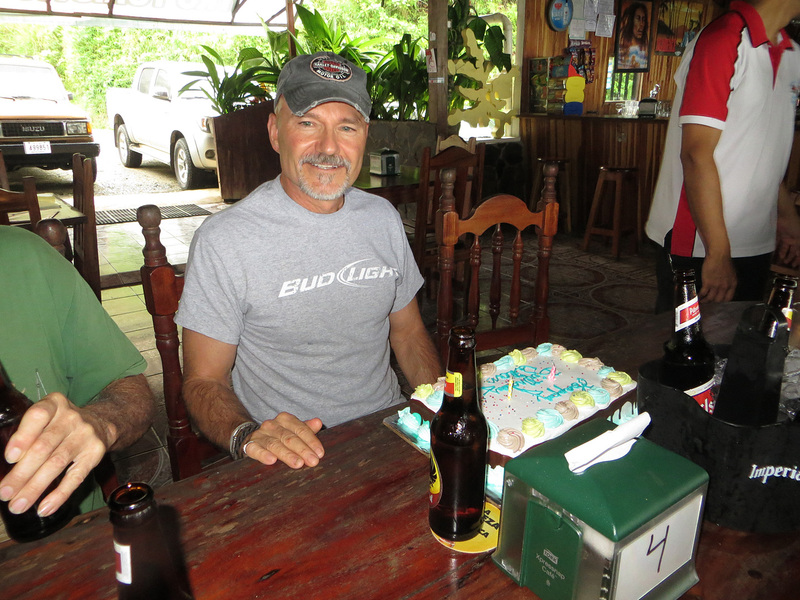 Our very last stop before we head back to our casita is lunch at Los Chorros with our Thursday lunch group. 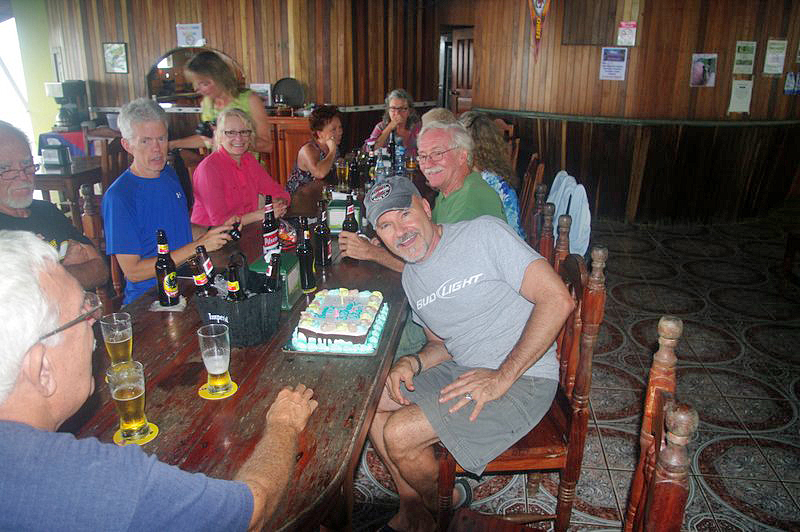 This day we were celebrating Allan’s birthday! Happy Birthday Allan! Be careful not to take a swig of beer too soon after eating a bite of cake! Looks like it won’t be too long before I have to come visit you! You are having TOO MUCH fun! Yes, you do need to come for a visit sometime soon! Love you, too!!! Enjoyed your blog. Hit all your excellent recommendations. Assume the “plastic” shop is Magico? We found their prices and quality a bit better than Menos on some items. What is the name of the supermarket by the bus station? 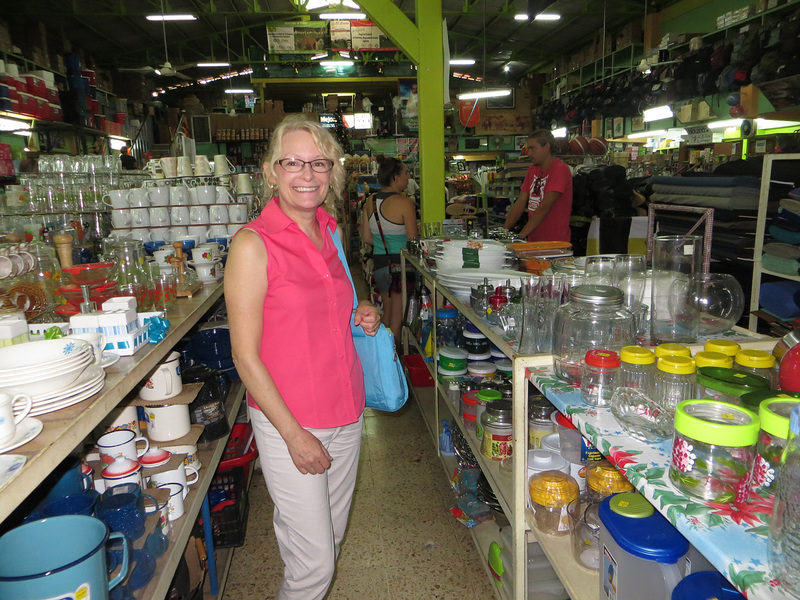 We went to Maxi Pali , formerly Maxi Bodega across from Restaurante Brazilia . Did very well there compared to prices at BM. Moved to Uvita two months ago and can use all the help I can get. Thanks! We’re glad you are enjoying the blog. The plastic store we were referring to is Bogantes, which is 1 block further towards the BCR from Magico. You should check it out. I’m not sure of the name of the supermarket next to the bus station, but it is in the multi-story building that has the Coopealianza sign on it. 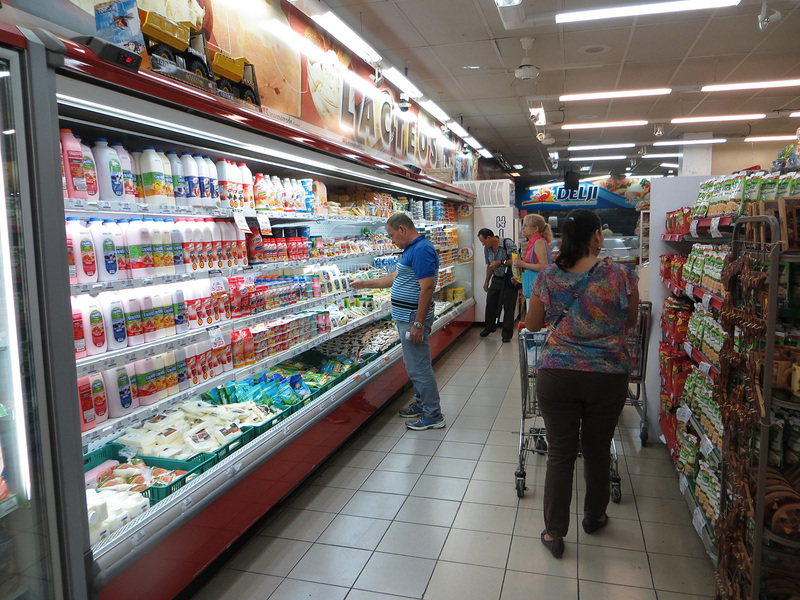 Another good supermarket in San Isidro is Lufers, across from the McDonalds restaurant. Take the time to explore and you’ll find many unexpected things!